Yet under such an approach, after you have memorized the Shostakovich concerto and the precision of your technique is daunting, what does your teacher tell you (presuming, perhaps, that you’re studying under a world-renowned violin teacher at Julliard)? It was always such a “wtf” moment for me when, after a year of rigorous drilling on one single concerto to the point where violin felt more like an athletic sport than music, your teacher tells you to forget all technique, to “let go,” and to feel into the emotions of the concerto, to speak my pain through the song. Only after technical mastery was I unleashed to play music. At that point it was no longer about just playing the piece that Mendelssohn wrote, but about using those notes to convey my point of view, my world, and my philosophy of life. That, of course, doesn’t come until after a prolonged trial of being forced to focus only on technique and to rote-copy my teacher’s method to playing the concerto. You are not given a voice until you learn the full range and potential of your voice box. My favorite analogy for learning tarot comes from pop culture– the Karate Kid movies and how the first step of mastering martial arts is mastery over mundane tasks that seem to have nothing at all to do with martial arts (wax on… wax off…). It’s like when my mother used to ship me off to recluse monasteries for the summer to cultivate who knows what and before any of us kids were even given meditation mats, we were given brooms. The first step of spiritual cultivation was cleaning the temples and having a bunch of nuns micro-manage how you cleaned the temple… omigod I remember being so ticked off, like, dude, if this is what it takes to attain enlightenment I could do this at home– Mom makes me do these chores all the time I should hit nirvana any day now if this is what it takes– My friend Lisa, whose mother also shipped her off to the monastery every summer because her mom, like mine, was batshit crazy, would roll her eyes while both of us were stooped over, knees on the cold tiles, with a duster no bigger than our forearms, sweeping a ginormous sprawling temple ground, despite the invention of the vacuum being a thing, remarking to me, “I thought we were shipped here to learn about enlightenment. Instead it turns out the nuns just needed free child labor.” And I’d giggle, because I agreed with her. That, of course, is an immature child’s perspective. Maturation, experience, spiritual cultivation, and wisdom reveals the extraordinary virtues of what we were being taught. If you read Holistic Tarot and interpreted it as stripping the magic from tarot, you may be experiencing my approach the same way 13-year-old Lisa and I viewed our monastery experience. My point of view is this: anyone can perform divination, and when I say divination I mean to achieve direct communion with divinity, but not just anyone can do so without first achieving mastery over the self and of the universe. Sounds like a tall order because it is. That said, it’s achievable when you understand the archetypal figures we all represent, archetypal motifs, and archetypal situations that manifest both internally and externally. Fortunately for us, we’ve got an app for that. It’s called the tarot. Tarot is a form of human technology where we infuse a mundane object with our ingenuity and transform it into something that connects the personal unconscious to the collective unconscious and in that manner, facilitate communion with divinity, or the artful practice of divination. Divination is an art, but to achieve mastery of the art, you first need to (Step 1) master actual knowledge of the self and of the universe through mastery of the archetypal imagery and symbolism of the tarot because as it turns out, tarot symbolism reflects the composite of our personal unconscious and the collective unconscious, and (Step 2) forget the actual knowledge you’ve mastered to truly be a tabula rasa, so that you can then experience psychic knowledge. The difference there between Step 1 and Step 2 is actual knowledge versus psychic knowledge. 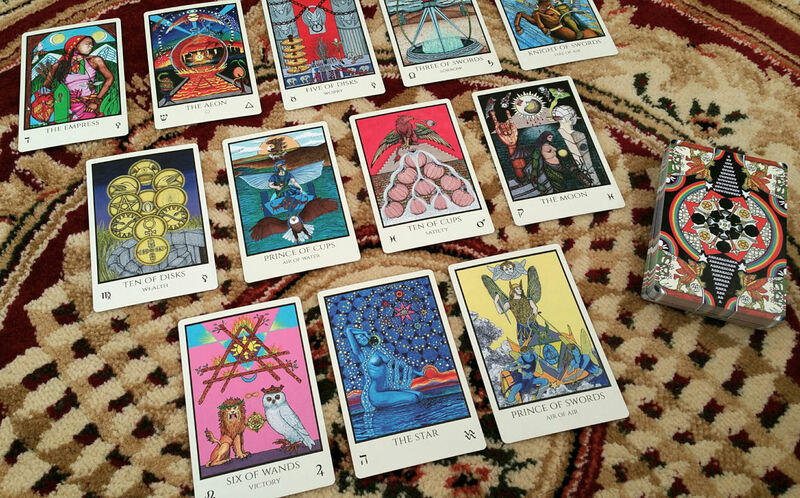 You can, of course, approach beginner’s tarot first through psychic knowledge and then at an intermediate point endeavor for actual knowledge, though that isn’t the approach espoused in my book. It’s like asking can you learn violin through the Suzuki method? Sure you can, but then you wouldn’t seek me out as your violin teacher because I don’t teach the Suzuki method. (By the way, no, I don’t teach violin. In fact I haven’t touched my violin in years.) Or it’s like asking whether improvisational music is a thing. Yes, of course it’s a thing. You can pick up a tarot deck right now, have no actual knowledge of the tarot, and read the deck in an improvisational manner, what people like to call “intuitive” tarot, as if rational tarot readers don’t also exercise their intuitions. If you are not a born psychic but want to tap into psychic knowledge, then yes, anybody can do so but not without work. Holistic Tarot sets forth the roadmap for the work it requires and it doesn’t look magical because it isn’t, not initially. If you believe yourself to be a born psychic and you’ve been kissed by the divine from birth to read tarot cards, then you definitely don’t need my book. Back to the story of sweeping temple floors as a kid. There had to be 50+ kids there each summer, sweeping temple floors, waking up at the crack of dawn to do shaolin out in the freezing cold courtyard, having to eat vegan all summer, and having to sit in meditation position for a torturous number of hours while nuns policed the rows of children with a hitting rod. 50+ kids each summer sat out under the hot afternoon sun while a shi fu (a master teacher) lectured them about the cosmos. However, decades later, not all 50+ kids chose to take a decidedly spiritual or religiously-devout path. Not all 50+ kids decided to endeavor for an interactive relationship with divinity. Reflecting back on the class of kids I was with those summers, only 1% went on to cultivate that Eastern spirituality in their lives. Yet what I believe with all my heart is all 50+ kids had their lives enriched by the experience. That’s Holistic Tarot. It’s not a book meant to take everyone on the path to practicing divination. Teaching divination was not the objective of my book. Teaching tarot was. I advised against using tarot initially for fortune-telling because that would be putting the cart before the horse. I advised against using tarot predictively because you first need to understand how tarot expresses the present. Unless you’ve been doing loads of self-reflection and shadow work, there is plenty about the present that you know nothing about. Learn to exercise wisdom over the present and to master actual knowledge of the archetypes manifested in the moment before tapping into the collective unconscious. There are plenty of people who enjoy the health benefits of yoga but do not advance onward to cultivate the spirituality of yoga. Holistic Tarot is that entry-level monastery experience for all 50+ kids but is also calibrated in such a way that those who are called to The Path will, after Holistic Tarot, find their own way to advance up the mountain. Holistic Tarot is that strict violin teacher I had in junior high who told me to do it his way until I got my technique down and then when I could play the runs in my sleep, see the sheet music photographically in my mind, then told me to forget everything he’d taught me to now use music to say what I have to say. The song, he says, expresses an archetypal emotion that he knows I must feel inside at some point, too. Tap in to how that emotion manifests for me and express that manifestation through the song. Express me through the song. That’s music interpretation. He made me learn all the rules so that if and when I decided to break the rules, then even the decision to break rules and which rules I broke were part of my voice, part of my artful expression. To understand magic, or the forces of the metaphysical realms, you first need to understand the physical realm. Understanding the physical realm requires discipline, which many of us dislike because discipline is hard. We want easy Mickey Dee’s drive-thru spirituality. We want to believe a one-time transcendental vision, a lucid dream, or just heredity is all it takes to master the art of divination, to possess that ability for communion. We’d like to fancy ourselves as being born psychic, or at the very least, so much more psychic than everybody else around us, so we don’t and shouldn’t have to put in the effort. And yet when that so-called psychic transcendental divinatory experience doesn’t happen for us simply because we snapped our fingers and commanded it to be so, we lose hope in tarot or, worse yet, lose hope in ourselves or in the existence of a divinity. Recently I came across a remark somewhere online in the tarot community about not believing in the efficacy of tarot, about losing faith. That’s like not putting in the effort to master the techniques of playing a violin, just holding the instrument up and playing willy nilly, finding the sounds coming out of your instrument to not be musical, and thus declaring you no longer believe in music anymore. Don’t try to play music on your violin if you don’t know how to play a violin. Try to understand your instrument and how to get that instrument to do what you want it to do. Then you can try your hand at music. Holistic Tarot has been out for over two years now and for just as long, I’ve had the free Holistic Tarot Study Guides available for you to download and work through. I am currently at work on producing a companion video lecture to complete the online beginner’s tarot course, tarot analytics style. =) I should be rolling out with that soon enough. Practitioners of craft, irrespective of tradition or heritage, are a universally funny bunch. It takes so very little for us to feel ideologically threatened and then we go on the defensive, alleging that when someone is giving her own opinion, she’s condemning your approach and attacking you personally. For example someone says (true story; commentary on recent tarot events ahead), “Based on my subjective world view and personal experiences, I believe only Jesus saves. None of the other ascended masters save people from hell. So I think in the past I was wrong about ascended masters. I’d like to recant what I said before because I don’t believe it anymore. Today, I believe only Jesus saves.” What happens next… the New Age community, tarot readers especially, are in an uproar, convinced that the expression of such an opinion is an attack on any other belief system. Maybe it is, but it’s a pretty stupid attack not worth crying over. It was the expression of an opinion formed from laughably poor logical reasoning, which, by the way, is totally okay! Most religious views are formed from laughably poor logical reasoning. It’s cool. It’s called faith. And yet so many felt personally attacked. Why? Isn’t that the question. It is, perhaps, not too different from my assertion of a point of view that instructs on tarot analytics, which then incites significant chunks of tarot readers to be convinced that such an assertion is an attack on their love of fortune-telling. I can not practice fortune-telling with the tarot and you can practice fortune-telling with the tarot harmoniously, in co-existence, ya know. 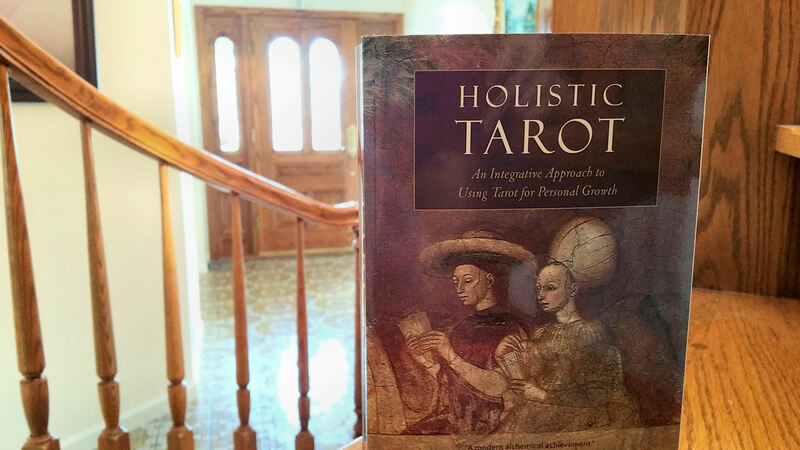 Anyhow, there are many approaches to tarot and Holistic Tarot represents one very specific and defined analytic approach, which doesn’t mean it’s an attack on any of the other approaches. It’s just distinguishing itself from other approaches. You have to find the approach that works for you and just because my analytic approach doesn’t work for you doesn’t mean you need to feel threatened or attacked by the existence of my approach. That being said, despite the book seeming to strip magic entirely from tarot, is my book calibrated with the intent of building a strong foundation for mastery of the magical realms? Yes. I started out analytics style, but just shortly… I quickly found the “intuitive” approach and started doing that instead, successfully for me. It was what I needed, being in high school sick of memorizing and studying… But a couple of years later I started reading up on tarot history, “traditional” meanings, book studies and yeah, tarot analytics. It might as well have been the other way around, but this was my path. Thanks, this is great! The music metaphor really clicked with me and gave me something to think about. There are always the jealousies of the underachievers. The “nay sayers” have nothing to offer to any conversation. It is a given in human nature. Personally, I get past them. You take them on and take them down. Keep doing what you do, Benebel. I love to learn, and you certainly bring out ALL points with intelligence and dignity. I love this so much. You are such a brilliant, thoughtful writer, and a brilliant diviner. (Divinator? Regardless.) 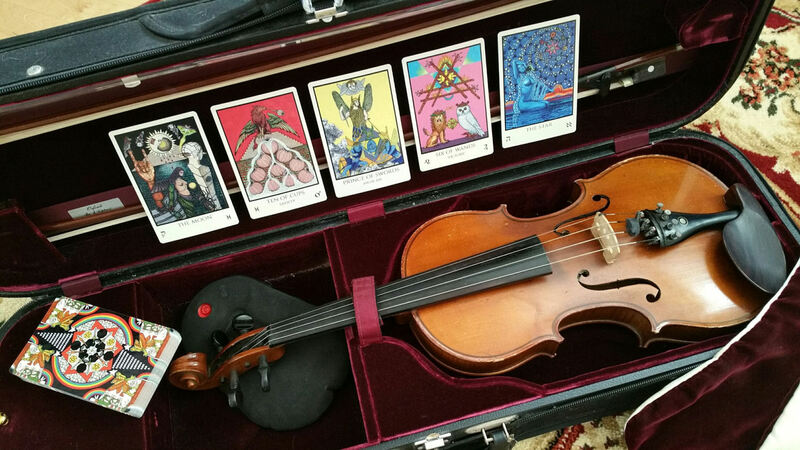 I agree completely with everything you’ve said in your post, and (though I’m about as musical as a rutabaga) my limited experience with musical training tells me that the analogy between Tarot and violin is perfect. Love you so much! Thank you! I love rutabagas by the way! Love this and your approach. Thank you! Forgot to add something I think of often in my arts, practices, and in life. Picasso once said: “Learn the rules like a pro, so you can break them like an artist.” I feel like that applies here. I think of myself a mostly intuitive reader. But I’ve found that the best preparation for working intuitively is a good knowledge base. For me, that knowledge base includes ongoing study of tarot meanings, numerology, astrology, symbolism etc. because all of those things are a point of departure for the kind of inspired stream of consciousness kind of reading I aspire to. The discernment to know when to set everything you’ve learned aside and go with the vision is a wonderful thing to develop but, in my experience, the best readings rely on both intuition and skill. I love your book and all the wonderful freebies on your website. Thank you for the in-depth description of the book and the approach you took in creating it. I’m a pretty analytical academic type, myself, so this book now is on my “to read” list. That is wonderful to hear and glad my spiel resonated with you! This is why I love both your books, btw. Completely agree with all of this. Aww, thank you for supporting both of my books! In art school, one of the first things they pounded into us is that you have to know the rules before you go around breaking them willy-nilly. I’m not surprised to see that a similar approach may be desired when attempting to master tarot. I totally agree with you on this and interestingly my training in magic followed the same pattern – learn the rules and structure, then once you have that down go and do your own thing. Definitely on the same page as you! I often feel that the intuition vs book-learning ways of reading is actually a false dichotomy: both involve drawing on knowledge that you’ve internalized, one has just been formally acquired, the other is knowledge that you’ve happen to pick on the way. Building a strong base can only expand your horizons in the long run I think.